In a narrow, microwave-safe container, place the white candy melts and 1 teaspoon of vegetable shortening. Microwave for 90 seconds at 70 percent power. Stir and continue microwaving for 30 seconds, then at 15 second intervals, until fully melted and smooth when stirred well. Hold an Oreo™ and dip half in the melted candy melts. 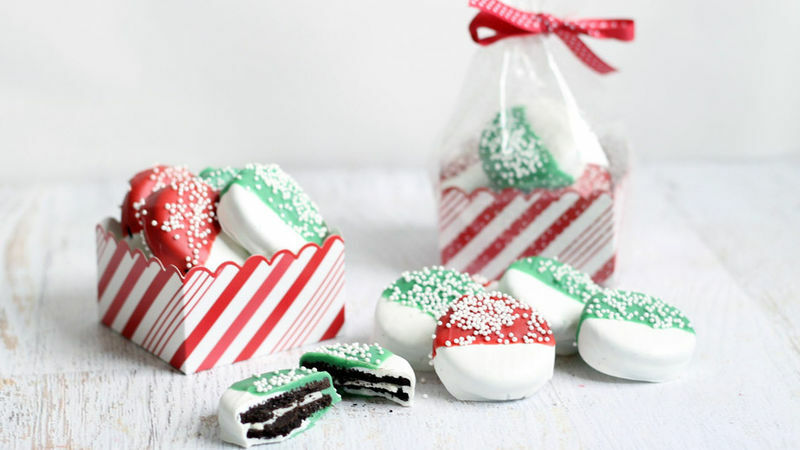 Gently shake off the excess and place dipped Oreo™ on baking tray. Repeat with the rest of the Oreos™. Let the white candy melts set well, about 30 minutes. In a separate container, melt the red candy melts with a teaspoon of shortening. Dip the other half of an Oreo™ in the melted candy melts. Shake off the excess and place on the baking tray. Immediately sprinkle the red side with the jimmies or nonpareils. Repeat with 9 other Oreos™. Dip the remaining Oreos™ in melted green candy melts following the above instructions. Let the Oreos™ set at least 30 minutes, preferably an hour, before packaging or serving.